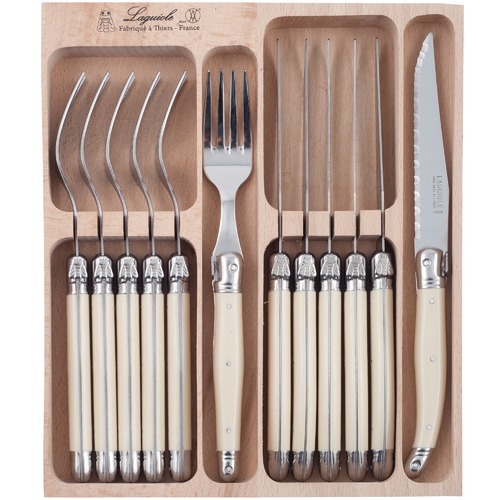 This classic, 12 piece cutlery set contains 6 forks and 6 serrated knives in a stylish, divided beech wood gift box with dovetail joinery. Each piece features the trademark welded Laguiole bee. The mirror-polished stainless steel cutlery is full tang, with coloured handles that will complement any table setting. Andre Verdier is one of France's oldest cutlery manufacturers, producing 100% made-in-France Laguiole pieces. 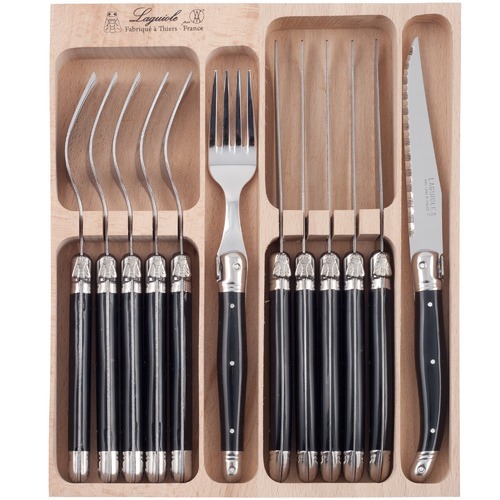 When you buy a 12 Piece Debutant Laguiole Cutlery Set online from Temple & Webster in Australia, we make it as easy as possible for you to find out when your product will be delivered to your home in Melbourne, Sydney or any major city. You can check on a delivery estimate for the Andre Verdier Part #: AV-12PC-SET-IF / AV-12PC-SET-B here. If you have any questions about your purchase or any other Cutlery Sets product for sale our customer service representatives are available to help.Whether you just want to buy a 12 Piece Debutant Laguiole Cutlery Set or shop for your entire home, Temple & Webster has a zillion things home.